It’s not my habit to write about what is happening at the moment. I don’t do it well. My cast of mind is one of memoir, and so it takes me a while to incorporate what I’m living enough into memory to be able to render the essence of it in what I write. So many quantum leaps have occurred this year that it’s been impossible to keep up. As you can see from the photo, I am just plain tuckered out from all the good stuff!! I like to call this photo “Plein Air Nap.” Last July my watercolorist friend Jeanne came over and said “let’s paint outside. 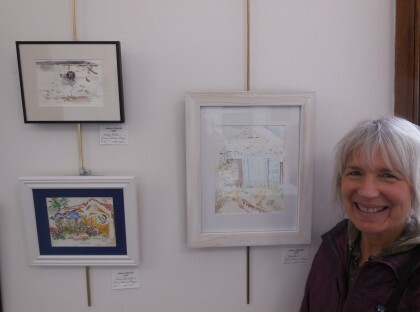 We’ll just play.” Plein Air is the French way of saying “to paint outside.” I met Jeanne a couple of years ago on the Paradise Creek Trail, on which she also takes daily walks. We passed each other enough times that we began to stop and chat. That’s another one of the lovely things about taking my daily walks with Romeo. Besides the magic of just being out in the day, no matter the weather, I also meet some pretty interesting people (and mushrooms). I never walk with music in my ears or my phone because I don’t want to miss what’s happening in the moment–which way the wind is blowing, how the clouds are moving, the shade of green the grass is, the moisture in the air–all of it is part of the experience to me. And so are the nods and smiles I get from those of us walking the trail on a daily basis. That I have become good friends with Jeanne is yet another gift of the walking magic. I hadn’t painted plein air in a long time. 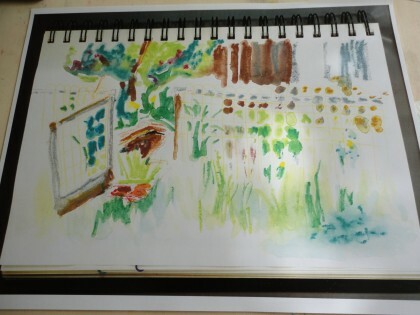 I have one plein air watercolor sketch I did looking into the gate of my star garden in a journal around the same time I drew “Listening to the Earth.” I had forgotten all about it until I sat outside that same garden and painted with Jeanne. 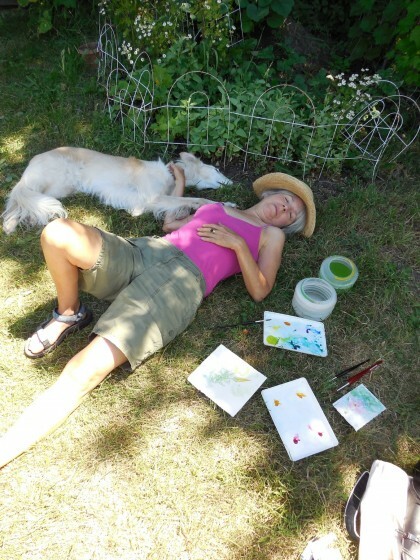 I was so tuckered out from concentrating after our plein air session that I didn’t even know Jeanne had snapped the photo at the top of this blog post until she sent it to me. It’s funny to me that holding the paint brush over the paper and concentrating as hard as I did was more exhausting than the days I spent repairing the hose or mowing the lawn. But it was a good tired. And I became committed to finding a pace to paint at that would allow me to keep doing it. At the time I had completely forgotten there is such an event as Palouse Plain Air here in Moscow. This September it was Jeanne who reminded me of it because she and another artist friend of hers were going out to paint together. At first I thought I couldn’t do it, but one morning while doing my yoga, standing in the tree pose, I realized that hey, my house was built in 1897, I don’t have to leave the property to paint something historical or urban. 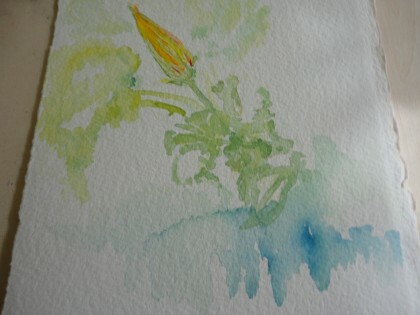 I went down to the Farmer’s Market and registered and began to paint outside all week. I painted six paintings in five days. I even ventured off my property to places I walk to. Three of these paintings are hanging in the Palouse Plein Air show at the Third Street Gallery. The previous Fall on the way to the library one morning Romeo and I walked past the Third Street Gallery which is in our city hall and saw the sign for the Plein Air exhibit. It was a weekday morning. We were the only ones in the elevator, and the only ones in the gallery. I walked slowly around the exhibit, enjoying all the paintings, wondering what it would be like to do it, longing to do it, but not letting myself take that too seriously, and never dreaming that the following year not only would I be painting again, but I would have 3 paintings in the show. And one of them would be sold. Sometimes it’s hard to understand what my dreams are telling me, even when they are spelling it out. I had this one 3 years ago. As you will see from the journal excerpt I knew it was important at the time, but it wasn’t until last week that I remembered it and was floored to tears by how literal a precognition it has become. Awakened with a feeling of wonder and power. Don’t remember the start of it, but there was a courtyard/atrium that had a big pool in it. There was some kind of water game going on . . . And there was a beach ball on the water, being bounced about. The other younger girls did not have good intentions. . .Something about not going into the deep water. . . I was observing all this. Talk about not knowing what I know when I know it. Here is a pile of 15 spiral bound sketchbooks piled on a shelf above my desk that have been my “journals” for the past 17 years. “I don’t like to write in lines” I used to tell people. That’s true. But the real reason I used the sketchbooks was so I could also draw, color, make collages or even paint in my journals. At the very least I allowed myself a full page illustration at the beginning and end of each journal. I wrote in colored inks in different directions or shapes, so that even the writing was a kind of art. And I was bereft when my hands would no longer let me do this. What a secret I’ve been keeping on myself. And what a blessing it is that this wonderful plant-based way of eating has given me back enough strength in my hands–and heart– to feel my way back to the place without words–that feels like home to me, where dreams come true, if I pay attention. Words are nice, too, and being able to type them is grand, but I don’t have to settle for just words anymore. That may be a funny thing for a woman who writes a blog to say, but life is pretty darn funny. And amazing. Especially when I discover I’m following the thread of life–in spite of myself. All healing roads converge on it. What a beautiful journal entry, and such a wise and telling dream! I am so happy to hear that eating this way has given you back the gift of seeing and telling through your mind, spirit, hands and brush. Makes my heart sing! I also loved hearing about your walks – I know just what you mean! Who wants to be cut off with headphones when out and about? ANYTHING can happen and who’d want to miss that?!?! Love the pictures and the paintings! You and Romeo look so peaceful. 🙂 And so happy at the gallery! I’m so glad you’re getting your art back – like reuniting with an old friend. It’s a constant reminder and encouragement that eating this way *is* the answer. As for me, walks I also do without headphones, just enjoying everything around me, but when I run… Well, I need to tunes to focus and not to konk out. 🙂 Journaling is pretty neat – let’s you look back on things you forgot (and possibly use as proof to win arguments), though I’ve never successfully kept at it. Maybe I’ll try again! 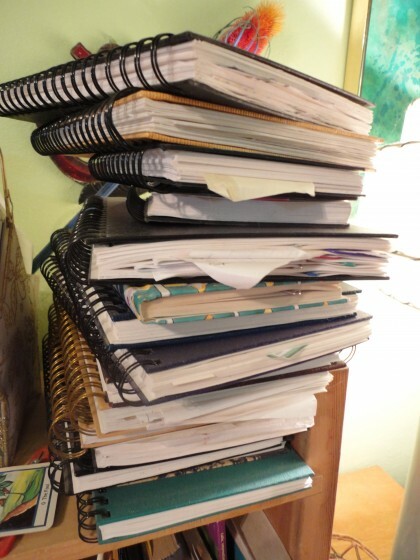 Your stacks of journals are a bit of inspiration. Converging on the thread of life- I like that. Lovely story of growth and change originating in plant based eating. Journaling for so many years has paid off in that you can reflect on your life, changes you have made, and your dreams. What a relief to process your feelings in this creative way. Appreciate your art and writing, inspiring me to move forward in my own creativity. Thanks, Michele! I enjoyed reading your feedback on my poast and on my journaling process. Thanks for appreciating it all–I am so glad it is inspiring you to more forward in your own creativity, too! !